I am a National Board Certified Health Coach and a certified FDN-Practitioner, this certification allows me to order labs for you in order to get you started on your healing journey. At the end of your initial visit I will recommend which lab tests to order to identify underlying causes. Conditions typically screened for and treated include gut dysbiosis, candida overgrowth, bacterial overgrowth, parasites, mold exposure, food sensitivities, hormone imbalance, and leaky gut. The approach is client specific, lab results and client consultation will determine what the treatment protocol is suggested. My approach to health and wellness is focused on Stress Management, Emotional and Mental Heath and Well-being, Exercise and Movement, Diet, and Silence and Meditation. At Balance Wellness Centers we use Planting S.E.E.D.S. for Change TM to help you live you best life and take control of your health! The purpose of a FDN Practitioner is to help people investigate and resolve the underlying causes and conditions at the root of their health concerns. When data from lab tests are correctly interpreted along with other clues, healing opportunities are revealed. FDN is a type of detective work that seeks to identify and correct the underlying causes and conditions that lead to your health concerns. To learn more about what a Functional Diagnostic Nutrition Practitioner is visit FDN's founder Reed Davis’ website. Following my certification, Balance Wellness Centers was established. I offer a free 15 minute phone consultation to understand the current situation facing potential clients and to determine whether or not I can provide the services needed as well as to help you asses which program or approach is best for you. This package consists of weekly, online group coaching sessions over a 10 week period. During these sessions, we will work through the elimination diet and reintroduction together, explore my 5-pronged approach to health and wellness, and practice goal setting. You will also have access to a Facebook support group as a part of this package and receive a free e-book copy of my book, “Kiss Your Bloat Goodbye” which will be available in February. The FDN-P program includes a stool test and hormone lab test, and consists 12 total visits, including an intake session, a personalized S.E.E.D.S. protocol, lab review sessions, on going coaching and unlimited email support for up to one year. Ala carte coaching sessions are available for clients who do not feel they need or want as much support. Your initial session will be between 90 minutes and 2 hours long, while subsequent sessions will be 45- 60 minutes each. Sessions can take place via the internet, from the comfort of your own home or in my Elmhurst office. For local ala carte and FDN package clients, I offer grocery shopping sessions and dining sessions to help you learn how to read labels, shop efficiently, plan meals, and order off of a menu. I believe that these dietary and lifestyle changes are hardest to maintain in public and social situations. I teach my clients how to order off of mainstream menus, so they are empowered to enjoy their social life while staying committed to their healing! Session frequency is determined by you. Some clients prefer a weekly check in, others prefer monthly. You may find you need more frequent check-ins at the beginning and fewer as time goes on. You set the pace depending on your personal needs. 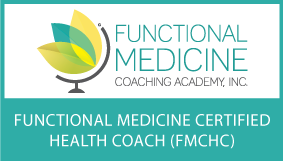 Are you interested in becoming a functional medicine health coach? Click the button below.